1. No Treaty change before the referendum. On Thursday 25th at the start of the EU Council, it emerged that Cameron officially dropped the idea of the EU treaties being changed before the referendum. His pledge that there will be ‘legally binding’ promises by the other 27 members to change the EU treaties in certain ways a few years in the future is a useful development for the NO campaign. No such promise will be believed regardless of the choreography. A future EU Treaty can be vetoed by any member and some members will also require a referendum. Nobody can guarantee in advance that a new Treaty will be agreed at all or on what terms, as the EU has found a few times already. A promise before the end of 2017 to change the treaties at some point in the future is the political equivalent of ‘the cheque’s in the post, and it will be paid in a few years time if 28 people still agree to pay it’. The NO campaign will be able to say simply, ‘If you trust all these politicians’ promises vote YES, if you suspect they may be lying as usual, vote NO to get a better deal.’ Polls will show strong distrust. 2. Trivial substantive demands from Cameron. The Guardian leak on Friday confirms how little Cameron is asking for. Do people in No10 really think that deleting phrases like ‘ever closer union’ and having the EU formally say ‘OK we won’t force you to join the euro’ would persuade people that the EU has fundamentally changed?! DC’s approach so far has been to send Llewellyn and Liddington around asking foreign governments ‘what should we ask for that you can give us?’ Unsurprisingly, this approach to negotiations is seen by other countries as consistent with Cameron’s lack of understanding of how EU business is done, as the Monnet-ist Foreign Office officials also ruefully acknowledge. There is no sign that the long-standing desire of Open Europe for a deal whereby Britain remains in the EU and Single Market but is outside all non-Single Market stuff is on the table or that No10 is pushing for it to be on the table. 3. The Commission plans its new Treaty to ‘complete’ Economic and Monetary Union before 2025. Meanwhile, as Cameron plays his role in the re-enactment of Wilson’s 1975 deceit, the Commission has its own timetable. It will be more influential than Britain’s. The Commission has, since Monnet, seen disasters as ‘beneficial crises’ – the answer to a crisis is always ‘more Europe’ (meaning ‘more centralised bureaucracy’). This was true after 9/11 and after the Madrid bombings. It was true after the 2008 financial crisis. It is true again now with the Greek crisis and the immigration crisis in the Mediterranean. This paper, ‘Completing Europe’s Economic and Monetary Union’, was published on 22 June 2015. It got little coverage in the UK media. It was written by ‘the five presidents’: European Commission President Jean-Claude Juncker; the President of the Euro Summit, Donald Tusk; the President of the Eurogroup, Jeroen Dijsselbloem; the President of the European Central Bank, Mario Draghi; and the President of the European Parliament, Martin Schulz. Stage 1) using existing treaties to push further including: single bank supervision, single bank resolution, single deposit insurance, a European Deposit Insurance Scheme (EDIS) at the European level, ‘further measures … to address the still significant margin for discretion at national level’ for bank regulation, a Capital Markets Union to ‘strengthen cross-border risk-sharing through deepening integration of bond and equity markets’, ‘harmonisation of accounting and auditing practices … addressing the most important bottlenecks preventing the integration of capital markets in areas like insolvency law, company law, property rights’, and a ‘system of Competitiveness Authorities … in charge of tracking performance and policies in the field of competitiveness’. A White Paper in spring 2017 to set out the transition to Stage 2 outlining the legal measures needed to ‘complete’ EMU, following explicitly the model of the Delors White Paper of 1985 which paved the way to the Single European Act. Stage 2) ‘a common macroeconomic stabilisation function’ to ‘improve the cushioning of large macroeconomic shocks’, maybe built on the European Fund for Strategic Investments, and a European Fiscal Board to ‘coordinate and complement the national fiscal councils that have been set up in the context of the EU Directive on budgetary frameworks’. Stage 3) completion of EMU will involve further major steps towards a political union including ideas such as a ‘euro area treasury’ and unified external EU representation on international financial institutions such as the IMF. This will require a new Treaty. It will also ‘require Member States to accept increasingly joint decision-making on elements of their respective national budgets and economic policies’. Dominic Lawson’s column also shows the dismissive attitude of the German Europe Minister to Cameron’s renegotiation. Cameron has long had what is to me a baffling hope that Merkel both wants to and is able to solve all his European problems. This delusion is similar to many other unrealistic delusions about the EU held in the Foreign Office and Downing Street over the decades. 4. The EU Council dinner witnessed a huge row over the migrant crisis. Although the migrant crisis has been in the news, it is perhaps not appreciated just how much concern it is causing across Europe. (The terrorist attacks also diverted media attention.) The situation is dire, it will get worse as thousands of Africans head north for the coast, it is obvious that the EU’s institutions and laws cannot cope, signatories to Schengen are starting to introduce informal measures that are strictly illegal (e.g. French police checking papers of people coming from Italy contra the Schengen rules), and nobody can agree on what to do. Worried diplomats have described the shouting at the dinner as some of the worst scenes seen in decades. It seems likely that the Italian government will be forced to declare some sort of emergency state and start ignoring EU and ECHR law to a much greater extent than previously. This will create all sorts of dynamics that affect the UK referendum. ‘Boris Johnson is preparing to call for a “no” vote in Britain’s referendum on the European Union in an attempt to extract greater concessions from Brussels than David Cameron is demanding. In a stance that puts him on a collision course with the prime minister, the mayor of London believes Britain should reject any deal Cameron puts forward because the EU will not give enough ground. Johnson has told friends that a “no” vote is desirable because it would prompt Brussels to offer a much better deal, which the public could then support in a second referendum. The mayor’s views, shared with friends last week, will send shockwaves through Downing Street. Both the “yes” and “no” camps had assumed that he would support Cameron in arguing for Britain to vote yes. A Guardian story on Monday said that BJ sources confirmed the Shipman story and Forsyth’s Spectator story similarly confirmed it. Since I blogged about this idea, many people have got in touch. A. It seems likely to many people that a NO vote would have to be followed by a second referendum on a new deal because the scale of importance of the UK-EU agreement, dwarfing the issues in normal general elections, would require giving people a vote. B. It is clear that escaping the supremacy of EU law enshrined in the 1972 European Communities Act will be a complicated process stretching over years – it will not be a simple event. A NO vote in the first referendum would not, as a matter of fact or law, mean we had left the EU or would immediately leave. It would in practice be a rejection of Cameron’s deal and a direction from the public for a new government team to negotiate a new deal. C. This issue is entangled in the Conservative Party leadership campaign. Some leadership candidates will like the idea of a second referendum – it allows them to position themselves against Cameron’s deal without committing themselves to OUT. They will be able to say, ‘David Cameron has got a bad deal that does not solve our problems on immigration or anything else, he’s wasted the historic opportunity handed him on a plate by the euro crisis and migrant crisis to negotiate a completely different European system, and if we vote NO we can get a better deal, we finally have a chance to do this properly’ etc. D. If it becomes clearer that a NO vote will mean a second referendum on a new deal, then the probability of NO winning is likely to rise. ‘I heard that the CBI thinks the UK should remain in the European Union no matter what. That the people of Britain should vote to stay in regardless of whether or not the Prime Minister wins the concessions that British business so badly needs… [D]oes it really make sense to say, so early in the process, that ‘the rules of this club need to change, but don’t worry – we’ll always be members no matter what’? SJ is right. Polls have shown for over a decade that most businesses regard the costs of the EU and the Single Market as greater than the gains and want many more powers brought back than Cameron is now asking for (e.g. ICM, April 2004). SJ could have added a historical lesson for the CBI about its long record of being wrong on big issues. Its forerunner advocated appeasement in the 1930s with the old ‘stability’ argument wheeled out. The CBI played an important role in pushing Britain into the disaster of the ERM. It tried to play an important tole in pushing Britain into the euro which would have been a disaster. Fortunately, businesspeople like Stanley Kalms and Michael Edwardes formed Business for Sterling (which I worked for 1999-2002). We surveyed British businesses and proved that the CBI was lying about business opinion and was systematically cheating its own membership surveys to give the false impression to the FT and BBC that ‘British business overwhelmingly wants the euro’ – sound familiar? In fact big businesses were split and small businesses were hostile by about 2:1. However, the power of the UK Government and the EU Commission makes it extremely hard for senior FTSE people to speak out against the EU while they get brownie points by backing the EU (cf. Branson who still speaks in support of Britain entering the euro). Many businesses were told in 1999 – if you support Business for Sterling, we will screw you. The same thing is happening now. Few journalists understand the politics of company boards whereby pro-EU people are licensed to speak out while anti-EU people are told to pipe down to avoid causing blowback. 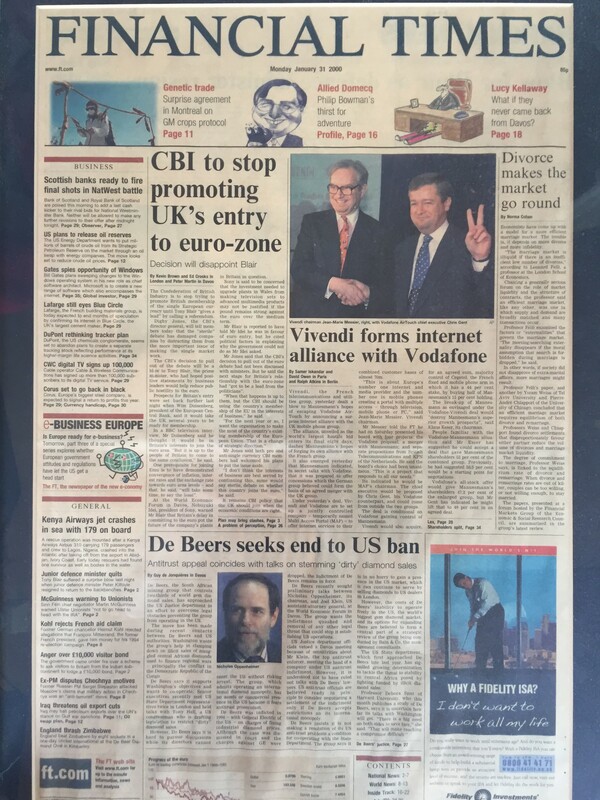 Within a year of starting, by January 2000 we had forced the CBI to withdraw from the euro campaign. Meanwhile the IOD and FSB were clearly hostile to the euro. The CBI is now arguing that Britain should stay in the EU on any terms. This view is out of whack with the general view of British businesses but the cabal that controls the CBI has never cared about this and the BBC has very rarely challenged them. The CBI has also just announced that Cridland will be replaced by a former ‘head of strategy’ at the BBC and ITV. Mike Rake said, without apparent irony, that she has ‘an impressive background as an economist, journalist, management consultant and policy strategist’. The CBI represents hired managers, management consultants, lawyers etc – it has never represented successful entrepreneurs. It is always controlled by a small number of politically powerful multinational firms (generally run by non-entrepreneur hired managers) that can be crucified by the Commission. This is why they are not taken seriously as the ‘voice of British business’ other than, unfortunately, by the BBC. The people who control the CBI should consider 1999. Unless the CBI changes its position, 1999 will be a picnic compared to 2016. 6. Business for Britain has serialised a big report on the economics of the EU which will be published in full shortly. 7. The Greeks have voted NO. Those in the Commission, Eurostat, and other EU institutions who colluded with Goldman Sachs and others to cheat the numbers to ease Greece into the euro have got away with it. The euro financial system was set up so that a lot of bankers made a lot of money out of artificially low Greek bond prices. What about when the music stops? IBGYBG (‘I’ll be gone, you’ll be gone’ as assholes in the City say to each other when ripping off their clients/customers.) Those like Mandelson who predicted the euro would be great for Greece still have their huge pension pots paid for by taxpayers and are invited on TV to pontificate about the EU, largely un-reminded by the BBC of their previous duff predictions. There are deep problems with the global financial architecture, from China’s shadow banking system to the recurrent flash crashes driven by high frequency algorithmic trading. There are deep problems with the euro financial architecture. Since 2008 global debt has increased enormously. There has been a huge distortion of debt markets with investors holding massive quantities of government bonds that offer very little future reward and great future risk. CDO’s, CDS’s, all sorts of synthetic credit derivatives that contributed to the 2008 crisis are back and being sold to idiots who don’t understand them by some of the same people who used such complicated scams to cheat the figures for Greece’s euro entry. Bureaucrats keep bailing out financiers. The public quite rightly rages that ‘us idiots on PAYE are bailing all these crooks out’. Politicians largely ignore them. In Britain, Cameron even defended the indefensible non-dom rules and has done nothing about the grotesque abuse of executive pay by hired managers paying themselves as if they are successful entrepreneurs, with institutional shareholders happily pushing the merry-go-round and getting their kickbacks. Everywhere one looks one sees insiders ripping off the public and politicians either colluding or helpless spectators. The EU system is, characteristically, not admitting its own terrible errors that have contributed to the destruction of the Greek economy. Even the IMF has told the EU that Greece’s debts are unsustainable and will need a haircut. But the EU leaders feel they cannot face this reality because it would lead to an explosion of demands from Spain, Portugal, and Italy. Instead of facing reality, Europe’s leaders have decided to turn the disaster into a morality play in which ‘the lazy Greeks’ are blamed for everything. Meanwhile, Brussels’s real answer is the Five Presidents Report (above) – deeper and further integration because, after all, as Delors said the whole point of doing EMU before political integration was that the problems with the former would force the creation of the latter, like Athena from the head of Zeus. The combination of no Treaty change and no substantial demands is no surprise to many. The EU timetable always made Treaty change practically impossible before the end of 2017 (other than an Article 48 minor change to lower order things, which NB. could allow DC to claim ‘I’ve got treaty change’). However, Cameron’s position since his Bloomberg speech has relied on teasing the media, his MPs, donors and others that he intended to fight for treaty change to show he was ‘serious’. He has decided to drop this pretence at the start of the process. His approach since the election has helped rally support for the NO campaign as it becomes increasingly clear that his talk of ‘fundamental change’ was just to keep people onside before the election. Some Conservative Party donors, who have suspected for a long time that the Cameron-Llewellyn team does not know how to negotiate, can see there is no serious attempt to reshape our membership. This is particularly striking given that the combination of the Greek crisis and the African/Med migrant crisis is pushing the EU itself to consider a new Treaty and new arrangements for the non-euro countries. This approach is also unpopular with some of Cameron’s spads in No10 and Cabinet ministers who think that Llewellyn – a diehard pro-euro/EU campaigner – is harming the prime minister with his approach. Some of them think that rushing it also means rushing the day of DC’s departure as the leadership campaign will effectively start after the referendum. Others have pointed out that rushing so transparently to get trivial changes is hardly the best way to win a YES vote – or to maintain good faith in, and good will for, the prime minister. So far Llewellyn is ignoring such criticism – if he hears it, which is perhaps unlikely given how No10 works. No10 spads are keen to stress to journalists that ‘Ed is completely in charge of this, my responsibilities are domestic only if you know what I mean’.